Network Edge Orchestration is a hybrid Cloud/Edge solution that combines our award-winning combination of EdgeView Service Control Center with our EdgeMarc Intelligent Edge™ solutions. 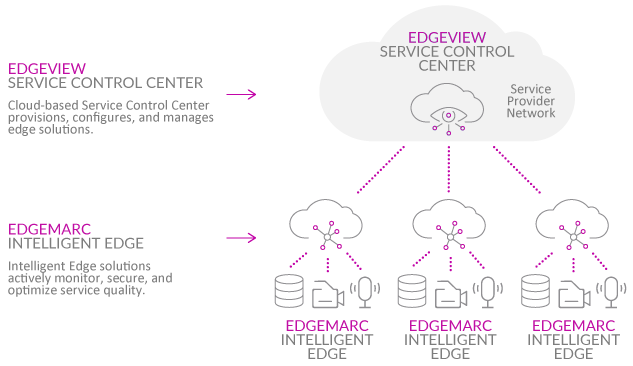 The cloud-based EdgeView Service Control Center provisions, configures and manages Intelligent Edge™ solutions and provides real-time visibility into performance and service quality. Intelligent Edge™ solutions at the customer premises actively monitor, secure, and optimize service quality for voice, data and video traffic. With over 500,000 Intelligent Edge™ devices under management, the Network Edge Orchestration platform enables users to rapidly scale to meet market demand, reduce capital and operational costs and provide a high-quality customer experience while reducing customer churn. EdgeView provides visibility to all voice and data traffic with real-time alerts/alarms for remote troubleshooting and management, fault isolation and reporting, and automated provisioning. The EdgeView Service Control Center (SCC) offers end-to-end visibility, from the MSO network to the customer premises to IP endpoints. It can automatically provision and configure Intelligent Edge™ deployment models, give real-time alerts on service quality issues, rapidly isolate service faults and deliver advanced analytics to optimize network performance and service quality.